Reverses hormonal imbalance, relieves menopausal syndromes, eliminates effects of stress, reduces pain and swelling, normalizes blood pressure, strengthens teeth and gums, regulates blood flow, and improves skin's elasticity. While Geranium oil offers a wide range of health benefits, it is not recommended for breastfeeding moms and pregnant women because it may have changing effects on the hormones and it has not been established yet whether it can be secreted through the mammary glands to the breastmilk. 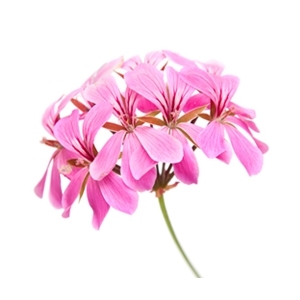 Geranium essential oil can be safely combined with Bergamot, Angelica, Basil, Cedar Wood, Lavandin, Carrot Seed, Lavender, Citronella, Neroli, Orange, Rosemary, Lemon, Grapefruit, Lime, and Jasmine. Get Your Geranium Essential Oil Now! I recently started Accutane and I've been using Essential Oils to also help with the excessive dryness, acne, fine lines, wrinkles, & hyper pigmentation. I've added this to my daily routine and have nothing negative to say about it! Its been working great and my skin looks amazing! Something I haven't seen in many years due to acne scars! I'm using a blend of Geranium, Lavender, Lemon, Bergamont, Ylang Ylang, Tea Tree, Rosehip Seed Oil & Frankincense every morning & night with either a Jojoba or Aloe Vera as a carrier.